Want to broaden your experience in K-12 educational leadership? The Pennsylvania Principals Association and Lehigh University’s College of Education are excited to announce a partnership that can help you earn graduate Certificate, Master’s Degree programs, Principal and Superintendent of Schools Certification in Educational Leadership. An Educational Leadership Certificate features 5 graduate courses designed to enhance your leadership skills in a K-12 school setting. The M.Ed. in Educational Leadership is a 10 course program that prepares graduates to be leaders in the elementary and secondary school environments. For those who wish to begin as a graduate Certificate student, all 5 courses will count towards the completion of a Master’s Degree. Courses are offered in a hybrid format—online during the fall and spring semesters and in a condensed format on-campus during the annual Summer Institute held on Lehigh University’s campus in Bethlehem, PA. Completing a Certificate program takes approximately one calendar year, with a M.Ed. program taking up to two years to complete. Students may also opt to pursue K-12 principal certification, director of curriculum and instruction certification, and superintendent of schools certification. Unbeknownst to many, the College of Education’s tuition rates are quite affordable compared to other similar graduate education programs in Pennsylvania. The cost of one credit hour is only $575.00. Should you take advantage of this partnership, the College of Education will waive your $65.00 application fee and offer you one free credit for each of your first two courses, which is a value of $1,150! Drexel University’s School of Education, in cooperation with the PA Principal’s Association is very proud to once again offer our EdD in Educational Leadership and Management program at a discounted rate to Association members. Drexel’s nationally recognized EdD program is available in a flexible online and hybrid format with 3-year and 5-year plans of study to fit your schedule and your budget. Select from nine diverse concentrations including Educational Administration with a PA Superintendent Letter of Eligibility. For more information contact: Dr. Allen Grant at 215-895-6232 or acg48@drexel.edu. Our Administrative Program for Principals and Superintendent Letter of Eligibility are approved by the PA Department of Education. flexible graduate programs in educational leadership designed to suit your busy schedule. 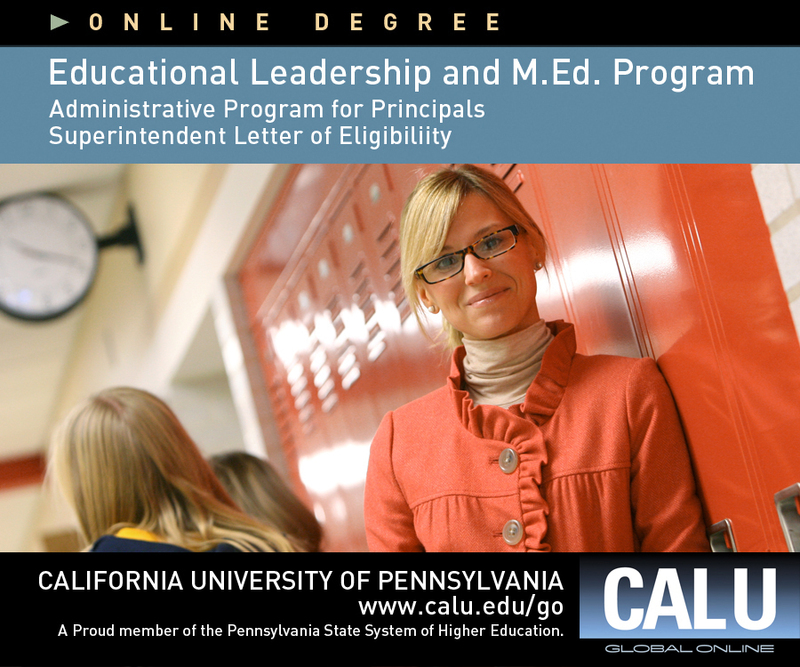 To kick start your academic career, contact Dr. Silvia Braidic, Program Coordinator, at braidic@calu.edu or contact Cal U’s Online Graduate programs in Educational Leadership at 866-595-6348 or e-mail calugo@calu.edu.